Writing a biography of Andrew Carnegie, back when I still worked almost entirely for textbook publishers, I was impressed with how his impoverished youth influenced the way he later spent the huge fortune he earned. He started working at age 12, shortly after his family arrived in the United States in 1848. He was a “bobbin boy” in a weaving factory. He worked hard, but he understood that the most important thing for getting ahead was education. He read constantly and went to night school. The efforts paid off, and he found himself with increasingly important jobs. By his mid-20s, he was superintendant of railways in Pittsburgh. He used his income to invest in new technologies and inventions, including sleeping cars for trains and steel mills. He recognized the potential of steel and bet everything on the belief that steel would become vital in the U.S.—which it did. The Carnegie Steel Company made him fabulously wealthy. Today, Carnegie Libraries and Carnegie Museums make up the single largest group of related historic buildings in the country. And why do I mention this here? Because there is a Carnegie Library in Mitchell, SD. 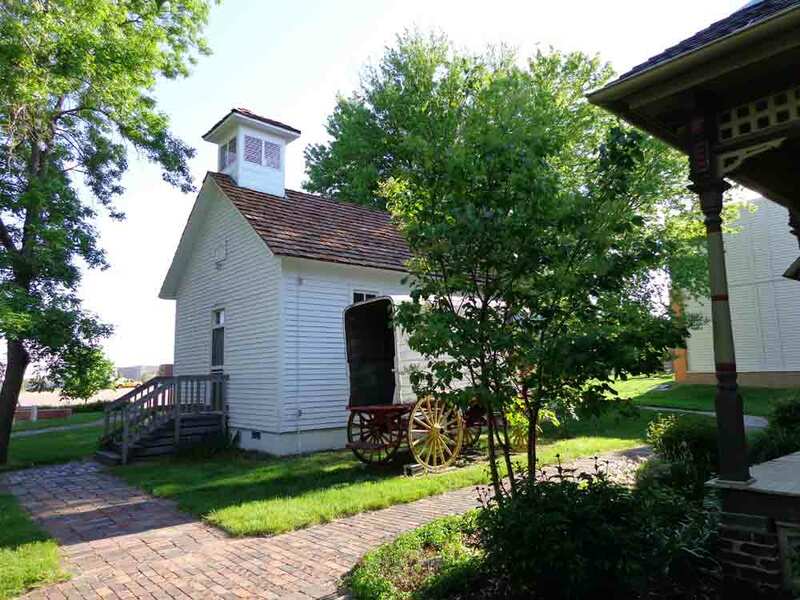 The 109-year-old library in Mitchell is now home to a combination of Corn Palace memorabilia and books, tools, mementos, and records tracing the history and genealogy of the Mitchell area. The dome of the library was painted by Oscar Howe, the Sioux artist about whom I posted earlier. 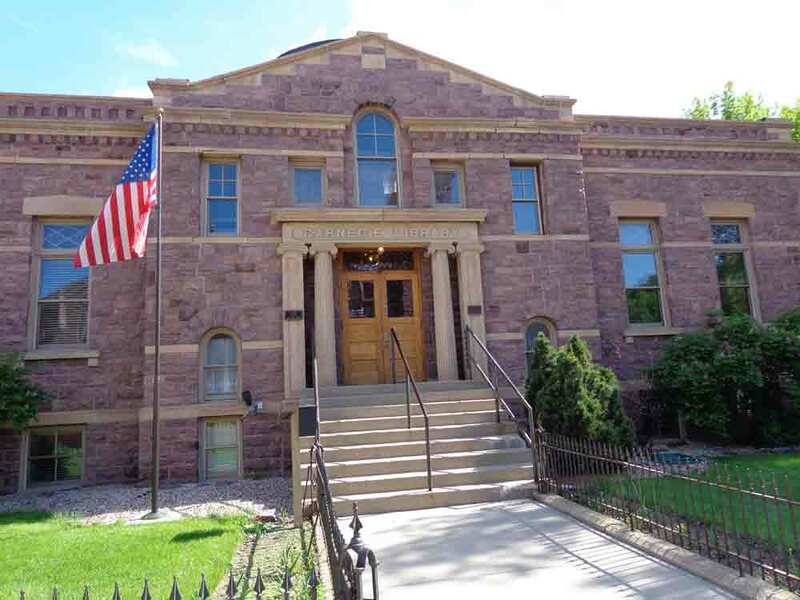 The building is also notable for being one of only three surviving buildings in Mitchell built of local red quartzite. 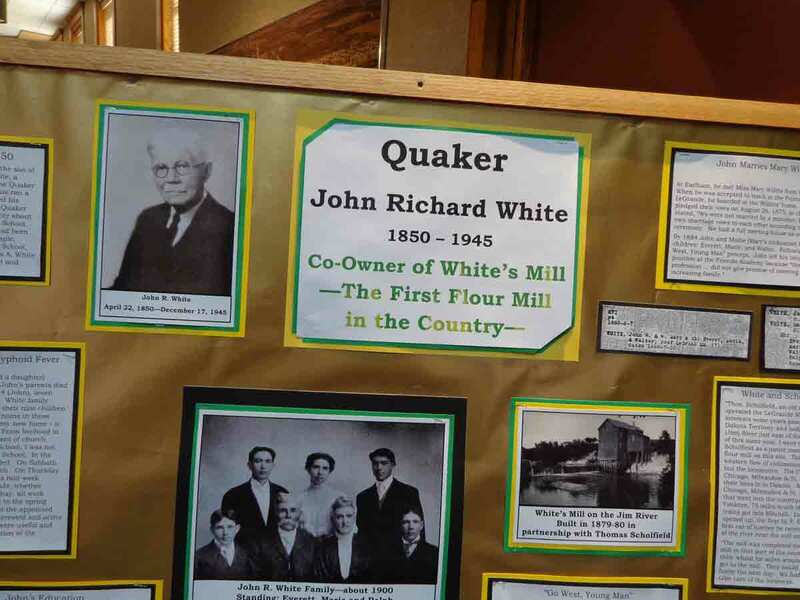 Here are two of the many displays, one a memento from the Corn Palace and one about local history—the country’s first flour mill was built here. Note on the poster about the mill the reference to the Jim River—because even in something as serious as a museum display, folks are too laid back up here to call the river by its formal name, the James River. The second floor of the museum is an art gallery. A large section is dedicated to Oscar Howe, the Sioux artist I posted about previously. The museum displays bronzes by Remington and Russell, plaster casts of Gutzon Borglum’s miniatures of the faces destined for Mt. Rushmore, work by Western painter Harvey Dunn, and the model created by sculptor James Earle Fraser of his most widely circulated work—the buffalo that graced the buffalo nickel (though the statue End of the Trail is better known, and Washington, D.C. would not look the same if he had not decorated so much of it). For Charles Hargens, there is a display of his art studio, as well as a gallery of original paintings and illustrations. Hargens was best known for recreating the West for such magazines as the Saturday Evening Post, Colliers, McCall’s, Boys’ Life, and more (and whose prints and posters you can still buy online). Through the splendid bookstore, and then outside, where Rod Brown led me and a handful of other visitors through the four historic buildings that have been moved onto the museum’s property. 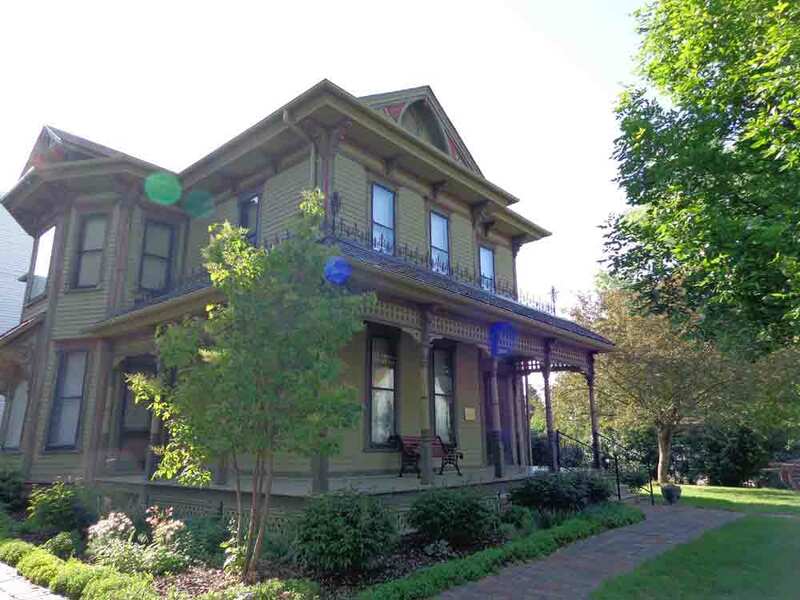 We toured the 125-year-old Methodist Church (still used for special events and weddings), a prairie schoolhouse (the one-room variety), a train depot (Milwaukee Line came through here), and ended up at Beckwith House. This handsome, Victorian confection was built for Louis Beckwith, the enthusiastic booster who got Mitchell to build the original Corn Palace in 1892. 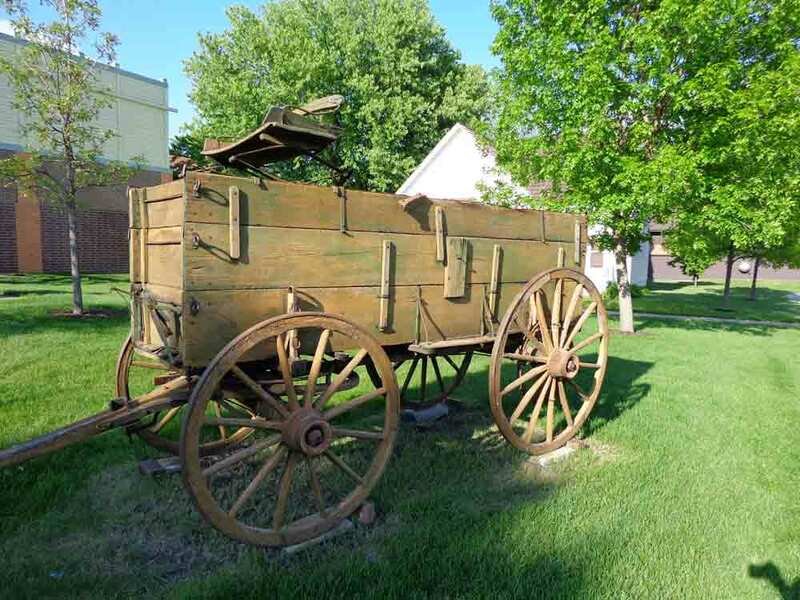 Wagons, a tractor, and other memorabilia are scattered around the site, to add to the sense of history. Great fun. If you do find yourself in Mitchell, this is another worthwhile stop. 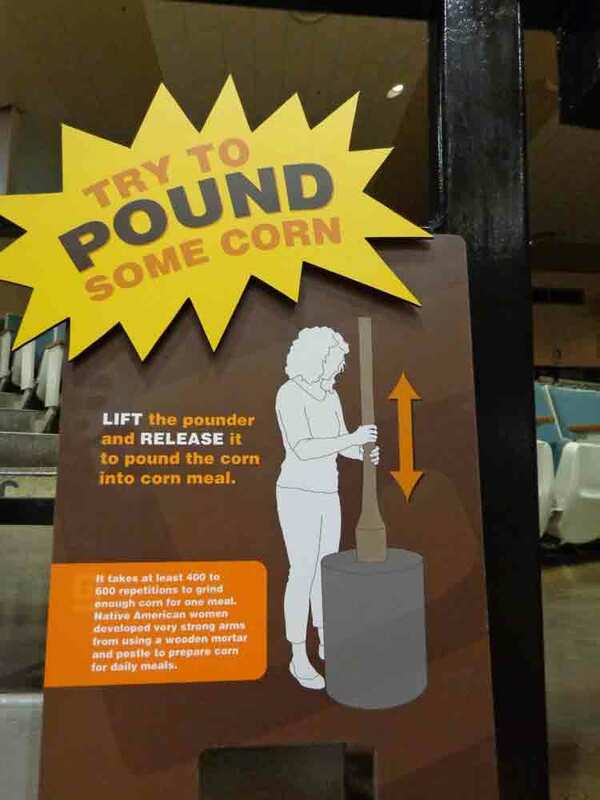 While there are interesting things to do and see in Mitchell other than visiting the Corn Palace (things I shall post on shortly), there is a definite focus on corn in town. After all, there are other places with good museums and interesting archaeological sites, but there is only one Corn Palace. 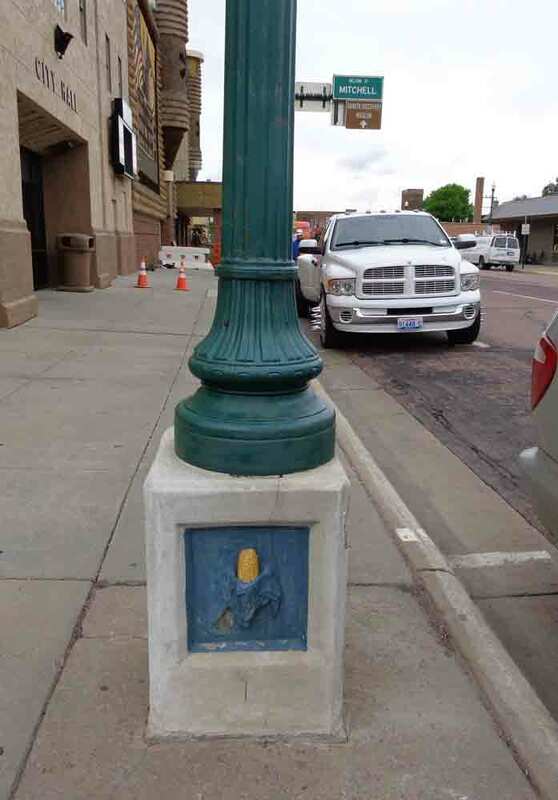 The first thing I noticed, as I rounded the corner on my first visit to the Corn Palace, was that the decoration cast into the base of all streetlights is an ear of corn. 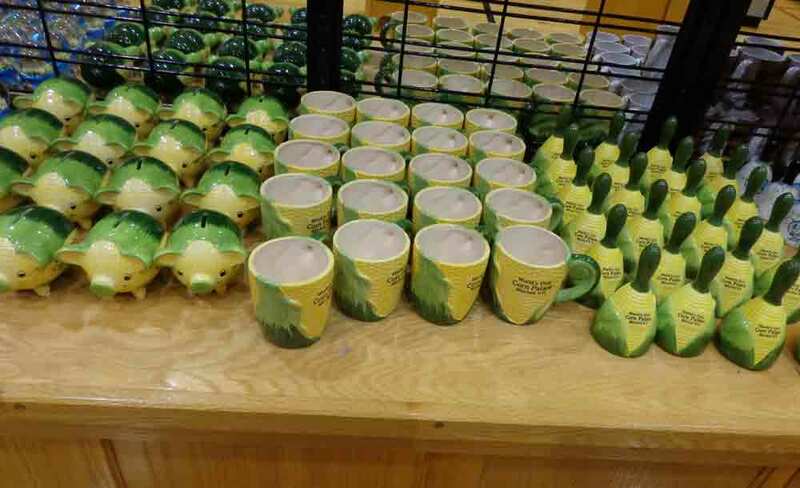 Across the street from the Corn Palace, there is a gift store that has displays about how the murals are created. In the open courtyard area adjacent to that gift store, there is a large, cheerful ear of corn named Cornelius. I was told that almost everyone who comes to Mitchell gets their photo taken with Cornelius, and even as I waited for a chance to take an unobstructed view of this corny mascot, I was repeatedly asked to take photos of visitors posing with Cornelius (which I was, of course, happy to do). 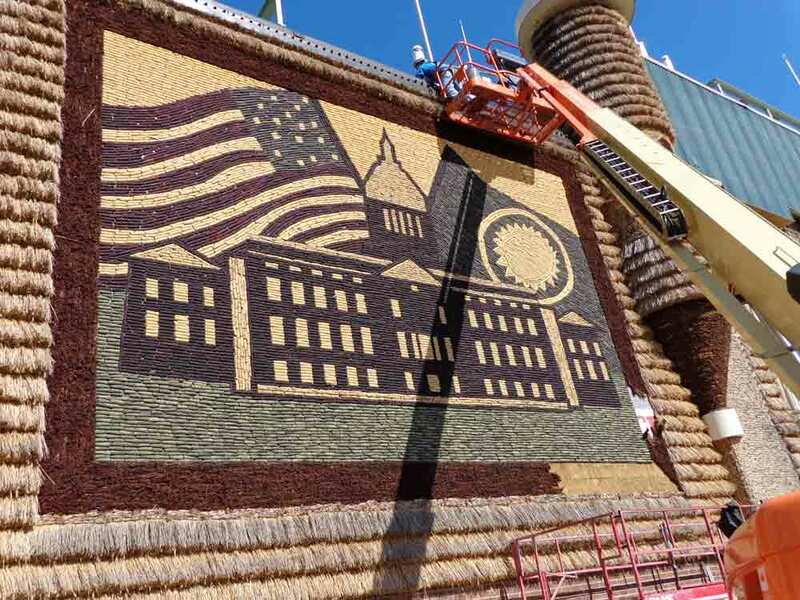 So the Corn Palace may be the corniest thing in town, but clearly the whole town appreciates what this iconic and historic building has meant, not just in terms of tourism, but in its representation of the agriculture that built and sustains the region. 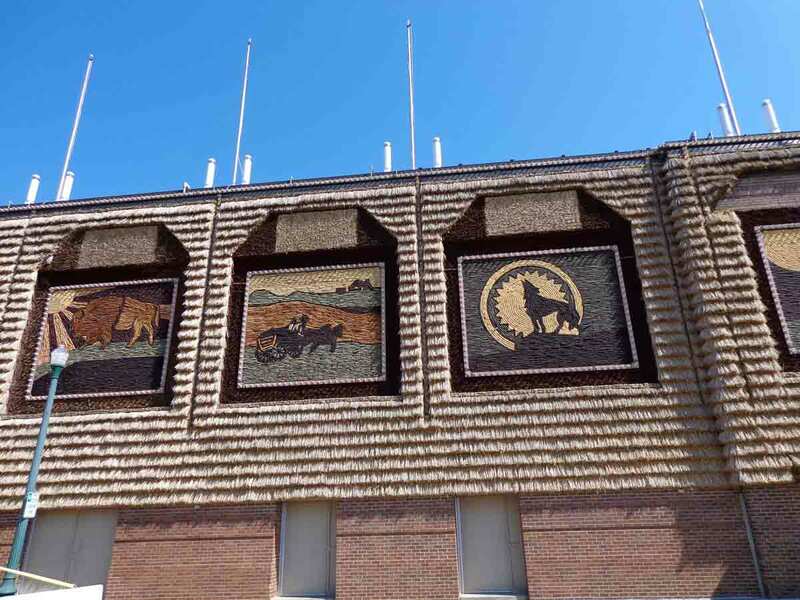 While Oscar Howe is closely associated with the Corn Palace, his career extended far beyond it, and I saw things he’d done in several other locations I visited in Mitchell. Howe’s story is one of success despite an inauspicious beginning. Fortunately, South Dakota has long been a state that valued and recognized artistic skill, which led to Howe’s not only being able to pursue art, it also resulted in his eventually being named Artist Laureate of the state. Howe, a Yanktonai Sioux, was born in 1915 on the Crow Creek Reservation of South Dakota. Poverty haunted his childhood, but his youth was also enriched by the stories of the history and legends of his people shared with him by his grandmother. His love of art emerged early on, and he would draw with whatever medium he could find, from drawing with twigs in the dust to using charcoal from the wood-burning stove. His talent was recognized and he was enrolled in the famous art program of the Santa Fe Indian School. Here, we was not only instructed in art but was also encouraged to take pride in his cultural heritage. Upon returning to South Dakota, Howe taught for a while in the state capital before being selected to paint murals under the Works Progress Administration’s South Dakota Artist Project. He then served in North Africa and Europe during World War II. 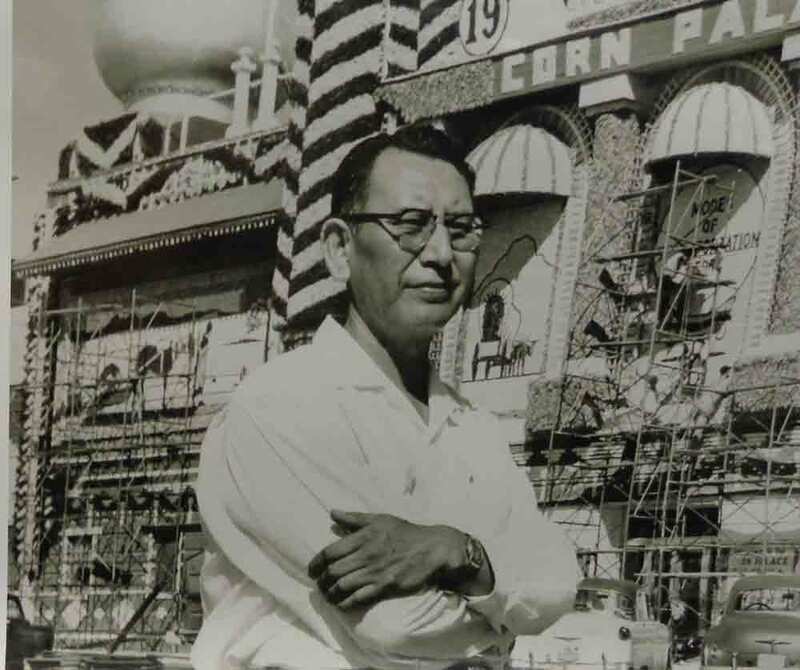 After the war, among the art projects he took on was designing the murals for the Mitchell Corn Palace—a relationship that would last from 1949 until 1971. During this period, Howe also earned both a B.A. (at Dakota Wesleyan University in Mitchell, where he also taught as Artist in Residence) and M.F. A. (at the University of Oklahoma). The Howe Gallery not being open yet at the Corn Palace, the majority of his work that I saw, other than in photographs, as at the Dakota Discovery Museum (about which more in a later post), which is located on the grounds of Dakota Wesleyan. A collection of Howe’s work can also be seen at the University of South Dakota, where he was a member of the art faculty and artist-in-residence from 1957 to 1961. Howe received numerous honors, local, national, and international, and in 1954, he was named Artist Laureate of South Dakota. Other important awards include the Waite Phillips trophy for outstanding contributions to American Indian art from the Philbrook Art Center, Tulsa, Oklahoma in 1966; the South Dakota Governor’s Award for Creative Achievement in 1973; and the Golden Bear Award from the University of Oklahoma, Norman, in 1970. Howe’s work became widely recognized, both for its style and for its interpretation of themes from Howe’s heritage. He is also widely credited with leading the way for other Native American artists to break away from stereotypes of “Indian Art.” I found his work to be accessible and evocative. 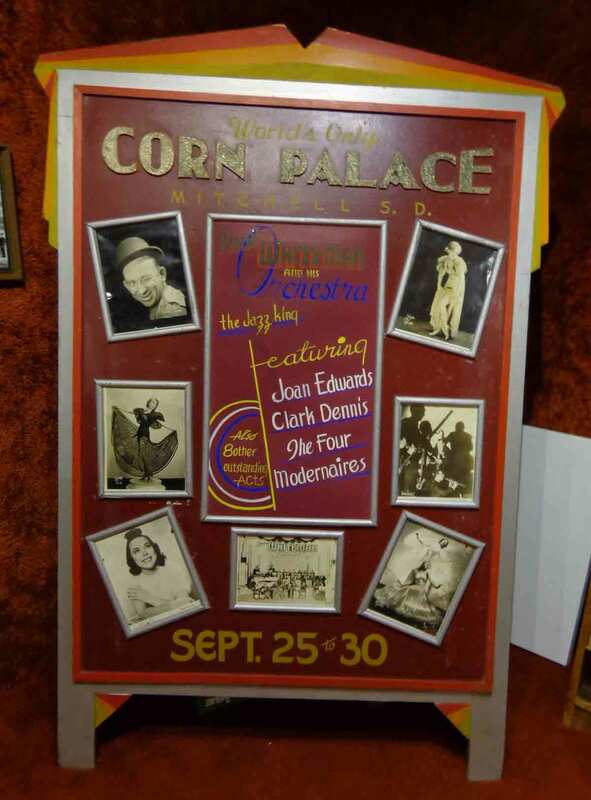 I also loved the fact that he recognized the remarkable opportunity afforded by association with the Corn Palace—which continues the tradition of highlighting the work of local artists. After a remarkable, influential life, Howe succumbed to Parkinson’s disease in October 1983. While the new overhaul was expected to be completed in April 2015, renovations were not quite finished when I was there in May. This did not, however, detract from how impressed I was. The massive new domes, which will be illuminated with colored lights, were sitting on a side street, awaiting the completion of all the other changes on the roof (which will now include wind turbines, as well as merely decorative elements). I was too early to see art in the new Oscar Howe gallery, but I did at least get to see the large, bright space where it will be housed. 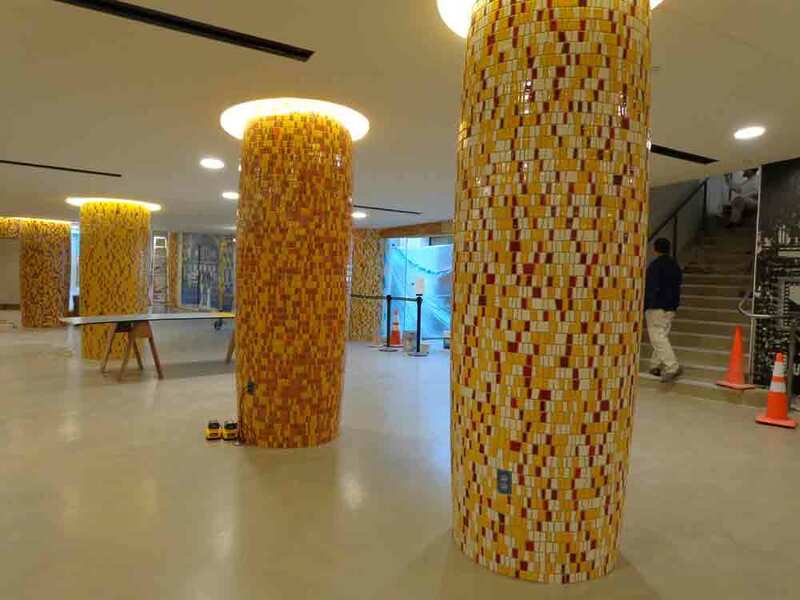 The lobby was nearly finished, with the tiled columns (looking handsomely corn-like) finished and most of the timelines in place, but final touches were still being put on. 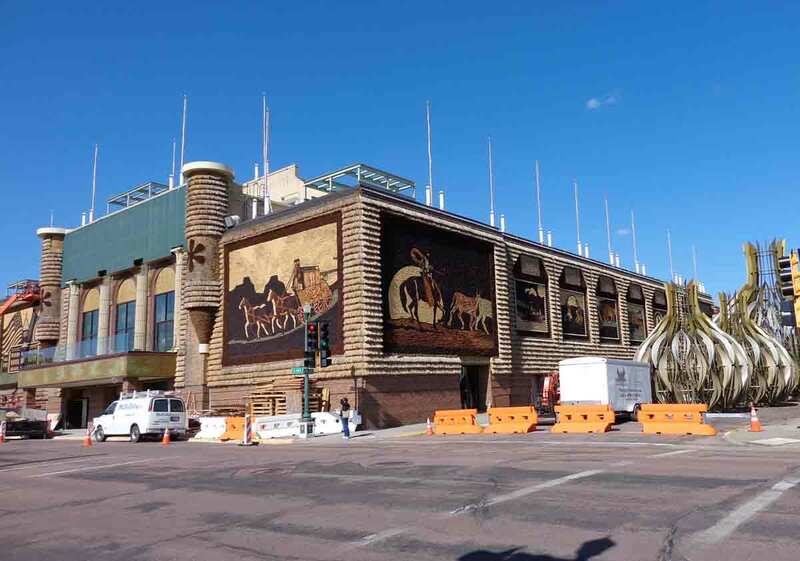 All that said, while there are more dramatic changes being made at present, as the Corn Palace is updated, there is a degree to which it spends much of the year in transition. In late May (just when I was visiting), the rye, other grains, and native grasses that frame the corn murals begins to get replaced. Then, at the end of August, the corn murals themselves come down, and, coinciding with the corn harvest, new ones begin to go up, generally completed by the first of October. (In other words, September is pretty crazy busy. 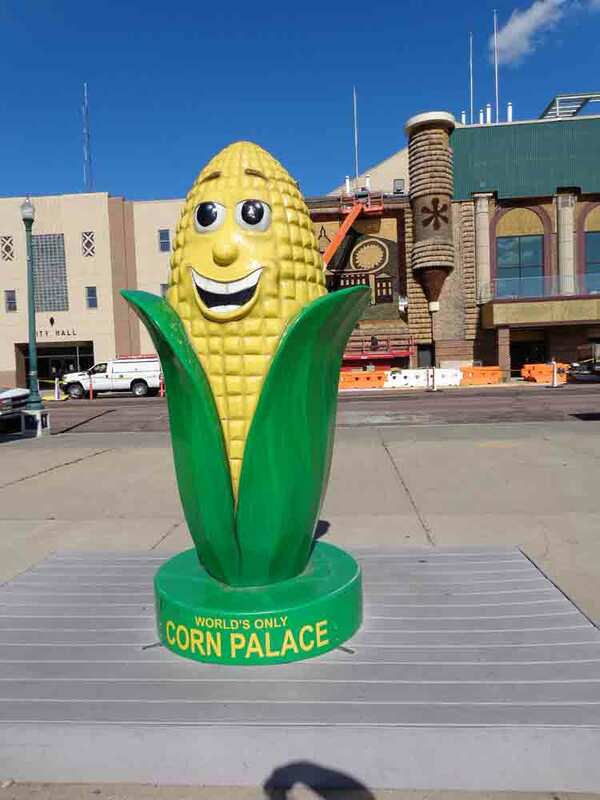 So while the Corn Palace wasn’t completely pulled together when I arrived, I was pleased that I wasn’t there in September, as the corn murals really are a highlight. That said, having seen videos of the murals being made, maybe that wouldn’t be such a bad time for a second visit. You don’t want to just stand outside, taking photographs—head for the entrance. 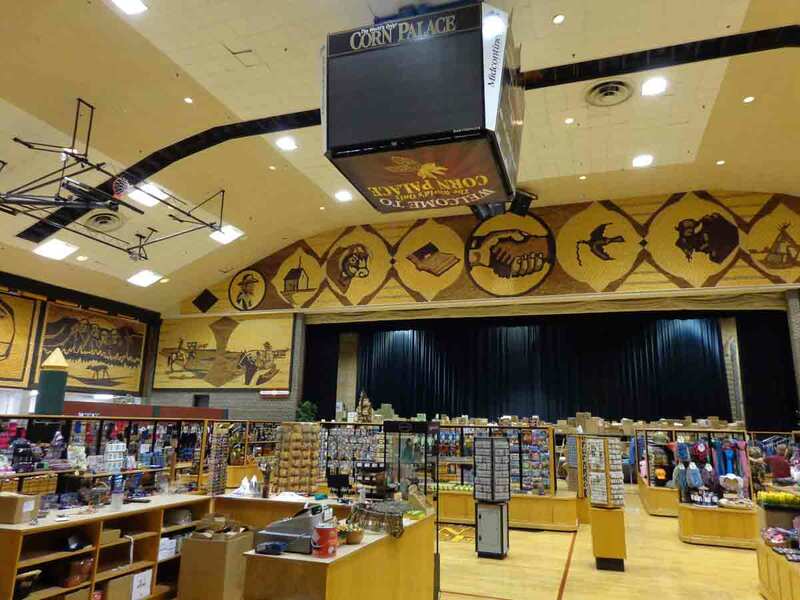 There is no charge for entering the Corn Palace, and there is plenty to see inside. 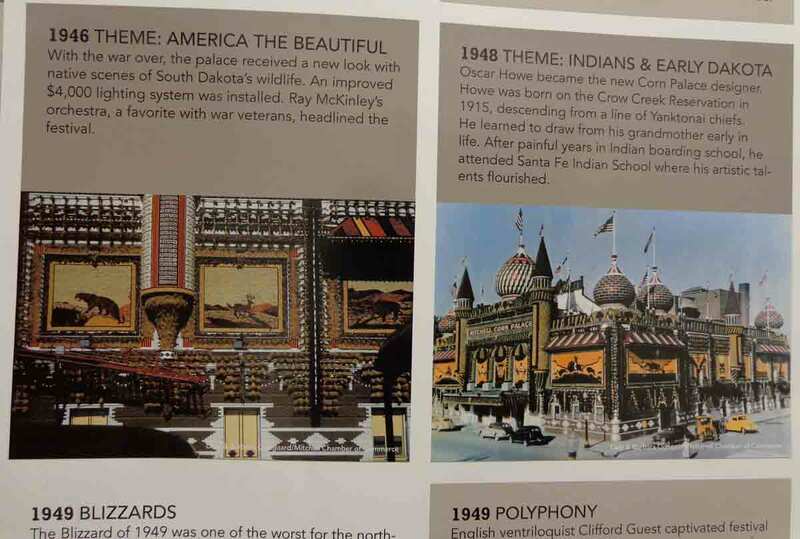 In the lobby, the walls are covered with historic photos and timelines of Corn Palace history, along with photos of the mural themes through the years. The support columns are shaped and tiled to look like giant ears of corn. As mentioned in the previous post, the murals on the inside have much longer lives than those on the outside. However, they are as impressive as the murals outside. There are also videos running constantly about the Corn Palace, Mitchell, and South Dakota in general (especially all the dramatic stuff out west, such as the Badlands and Mount Rushmore). While it wasn’t yet opened when I visited, they are currently creating an art gallery on the second floor, dedicated to long time mural designer and South Dakota artist laureate Oscar Howe (more on him in a later post). Of course, free entry doesn’t mean you won’t have the opportunity to part with a little money. When there are no basketball games or concerts, the main floor is taken over by a nearby gift shop, and the array of stuff for sale is astonishing—and while some is kitschy, there is much that is wonderful. There is also an abundance of food, both among the souvenirs (popcorn being especially abundant—and great, I can happily report) and from the “corn-cession” stands, which offer snacks and beverages. So definitely come inside when you visit Mitchell. As I mentioned a few posts ago, I recently embarked on a driving trip through the northern section of the greater Midwest. I covered a lot of territory and learned a lot of fascinating stuff. Now I get to share some of that with you. This was not my first time in South Dakota—I’d seen Wall Drug and Mount Rushmore on a previous trip—but it was my first visit to Mitchell and the famous Corn Palace. I would discover that Mitchell had more to offer than this famous venue, but this was what drew me there. 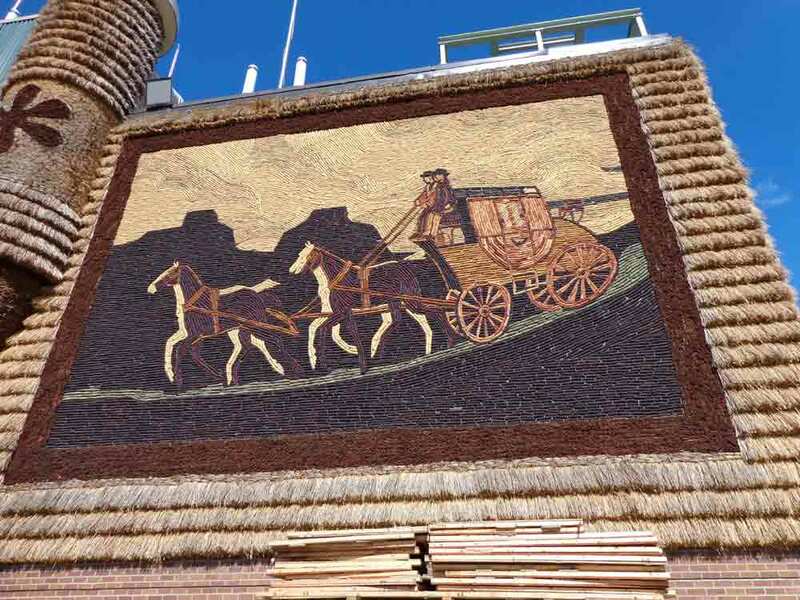 I cover the history of this Corn Palace and others in Midwest Maize, so I won’t repeat that all here, but there is a lot more to know about this iconic Heartland destination than its general history. First and foremost is that it’s a lot more impressive than I had imagined based on the photographs I’d seen. It’s a huge venue, with a massive concert/theater stage and full-size basketball court, plus all the seating needed for those who are drawn here. However, even more surprising to me were the corn murals. In photos, one sees the images, but in person, one can see the staggering amounts of corn and the craftsmanship and hard work that go into creating the murals. 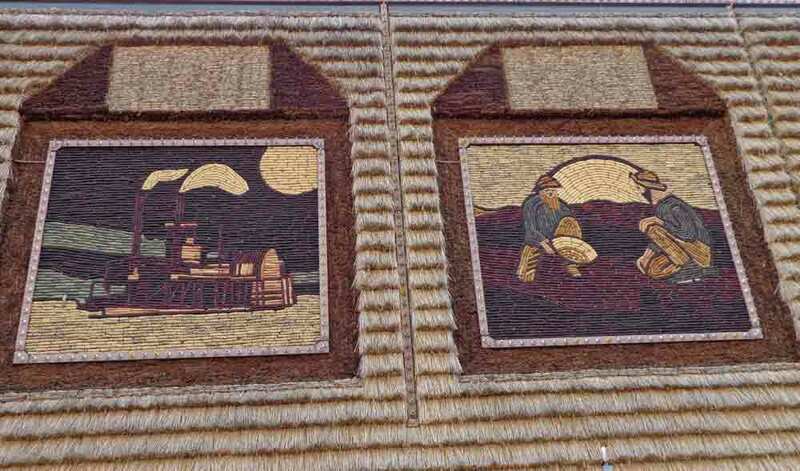 More than 275,000 ears of corn, all in natural colors, are grown each year to create the murals. Each ear has to be sawn in half lengthwise, so that there is a flat side to affix to the palace wall. Everything is done by hand. And it’s fabulous. This year, 2015, is the 125th anniversary of South Dakota’s obtaining statehood, so the theme for this year’s murals revolves around aspects of state history, from Native Americans to settlers to the State Capitol. 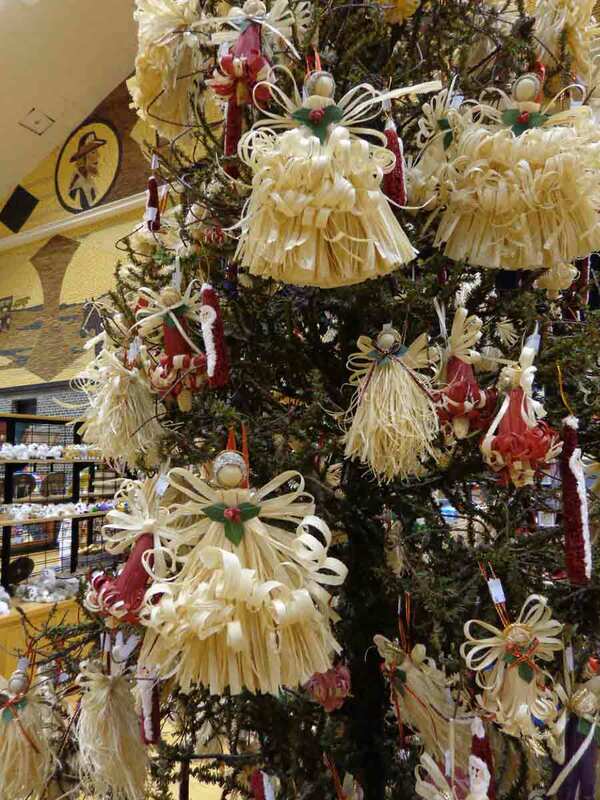 Since the Corn Palace is more than 120 years old, that means it got started very early in the state’s history. It was being renovated when I was there, so the domes were not in place, but there was still enough magic to make me glad I’d gone. I hope these photos help demonstrate how large and how remarkable the Corn Palace is. 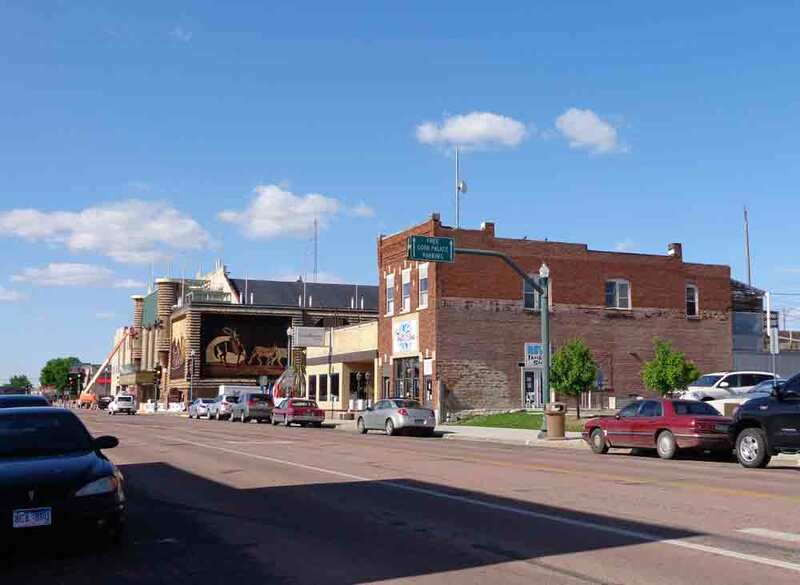 Corn Palace down the street–a little perspective emphasizes its size. Large mural on the front, showing both history and the use of corn. Smaller murals highlight details of life in South Dakota. More South Dakota history in corn.